Maybe you know the situation: In front of you there is a digital decoder on the workbench, and before you undertake its complicated installation into the loco, you would like to know if the decoder works as advertised. But, how do you test it? The Profi-Tester helps you: It’s designed for testing decoders before these are installed into a loco. The Profi-Tester is simply hooked up to your digital central station, or the LokProgrammer. This device can be used with any dcc system to reset , address and consist locomotives. The single input breakout board for the BDL168 block detection eliminates soldering connections to the card edge or card edge adapter of this product. 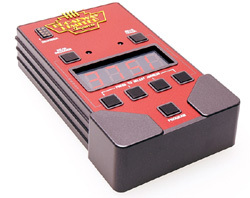 This design has a single input, meaning all 4 detection zones (and all 16 sections) are connected to a single booster, command station or DCC circuit breaker. The PM42 breakout board is setup to accept up to 2 inputs and 4 distinct outputs. Each output can be configured with jumpers to make it a reversing section. assuming the correct OpSwitches have been set inside the PM42’s memory. The SE8c breakout board brings out all the connections available on the SE8c’s edge connector. 1/2″ wide x 36 yd. roll of Kapton tape. Kapton tape is a very high temp. resistant insulating tape for use in tight areas for positive insulating of metal to metal surfaces. 1/4″ wide x 36 yd. roll of Kapton tape. New design , fits most DCC throttles.